Thank you for trying our Alligator in the Elevator: Tag, You're It! app. Thank you for downloading and trying out our Alligator in the Elevator: Tag, You're It! app. If you like what you see please consider downloading and trying one of our other Alligator in the Elevator apps below. The app is just excellent for the kids. It is a total fun with learning for the kids. I recommend to download and and keep it in your device. Not just for kids but nice for adults too. Reminds me memory table game but this one is with more action. Match numbers and actions. Kids love it just like me. My son LOvES ❤️ puzzles! We are often out together and I don't like him playing video games so this app is perfect to keep him busy while his pop is taking care of business. He loves it already. Thanks! “Educational activities at a young age are vital to developing your child’s cognitive abilities. 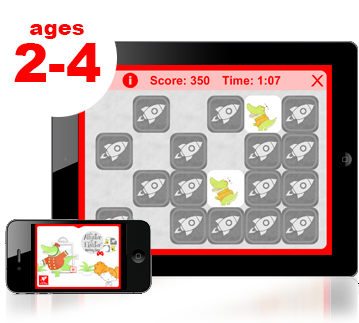 The multifaceted content in this app is designed so that kids experience learning to recognize and write the numbers 1-10 through several learning techniques. For instance, one interactive activity uses haptic touch to follow the children’s gestures as they trace the numbers, while another uses shapes to visualize the counting process. Children can play games at their own pace while progressing to increasingly advanced content." This is a smart app for kids teaches writing to toddlers. I would recommend it to all parents out there. Our grand daughter loved the elevator floor match and then drawing the numbers herself. Keep up your great work. The featured or most popular apps on an app store may be very different from those highlighted by review sites. Most popular apps may not be as highly rated as other apps for any number of reasons—so we encourage parents to look beyond the lists of top apps in the storefronts. Below are some things that set Little Starship® apps apart from the rest. We provide a specific age range or developmental stage in the descriptions of all Little Starship our apps. Was there a child development or literacy expert on the team that produced this app? Is there a guiding curriculum or educational theory? What kind of research has been conducted to support an app’s claims to teach specific skills or concepts? Tap the 'info' button on any Little Starship app to find this information. We encourage your feedback. At Little Starship Productions we involve parents at every stage of development. Parents and educators have the power to influence design! We encourage parents and educators to voice questions and concerns with any of our apps. Whether by leaving a review, or contacting us directly at littlestarship@ibtyllc.com, we count on parents to help influence the quality of our apps.